The TrackMan 4 Radar unit, as available at JWhitaker Golf, is the worlds leading technical swing analysis system used by major equipment manufactures, top coaches and tour professionals themselves. Offering the most in depth analysis of any ball flight system, TrackMan provides measurements on spinrate, clubspeed, smash factor, carry, launch angle, club deliver and much more. 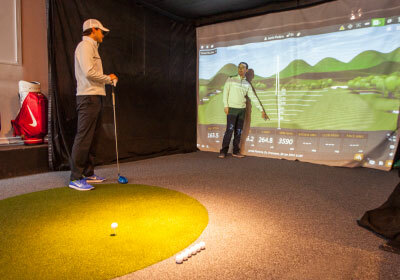 All of this information is displayed on screen for the player and coach to analyze, along with a 3D representation of the shot you have just played. In addition to in-depth swing analysis, TrackMan can also be used for dynamic club fitting. At the JWhitaker performance centre, we can use TrackMan to the average distance with every single club in your bag in order to analyze the gap structure of your set of clubs. We can also accurately measure the parameters required to evaluate the right clubs for you, taking into account the most suitable shaft, and club head.